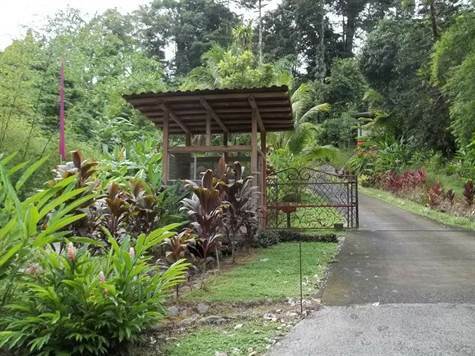 This home, about 2 kilometers outside of Quepos, is located in a safe, gated community, which provides access to a tennis and recreation center nearby . Besides the spacious guest bedroom, an extra room and the bathroom, there is a fully equipped kitchen as a part of a large and bright living-/dining room with a great jungle view outside the windows. The house was constructed with unique high quality materials, it has imported Italian masonry and floors, hand crafted stone trim-moldings as well as vaulted and waved natural bamboo ceilings and palm fan fixtures. A patio adds more space and makes you able to sit right next to greenery, colorful tropical flowers and palm trees.